Lip's Stick is an item in the game Super Smash Bros. Melee and makes a return in Super Smash Bros. Brawl, Super Smash Bros. for Nintendo 3DS / Wii U, and Super Smash Bros. Ultimate, where it is used as a battering item. When a player gets hit by a Lip's Stick, a small flower would be planted on his or her head, doing gradual damage. 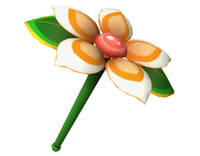 Players hit continuously would cause the flower to grow larger, prolonging the duration it is present, thus causing more damage. With a strong or Smash attack, some magic shoots out of the item, slightly extending its range. Eventually this magic runs out, but players hit by the item itself will still suffer its effects. Japan Only This magical stick was used by the character Lip in the Japanese game Panel De Pon, which was later released as Tetris Attack in the United States. Lip's Stick causes a flower to sprout from an enemy's head, inflicting damage as it grows. Quickly tap the Control Stick back and forth to get a flower off of your head. (Japan Only) An item that causes a damage-dealing flower to bloom on people's heads. If you find yourself with a flower on your noggin, start rattling the Control Stick back and forth to shake it off. Some characters can pull off having flower-covered heads in style, while others clearly cannot. Super Famicom Panel de Pon (Japan) With this wand in hand, a simple flick of the wrist will sprout a flower from a character's head. If you keep on flicking, the flower grows larger. The bigger the flower, the more nutrients it craves, dealing more and more damage to the host. Shake it off by running around real fast! Lip's Stick was named after the fairy protagonist Lip of the Japan-only Super Famicom puzzle game Panel de Pon. It was localized to the West as Tetris Attack, a Yoshi-themed game with characters from Super Mario World 2: Yoshi's Island. This page was last edited on January 10, 2019, at 15:52.